The Pharmaceutical Common Achievement Tests Organization developed the system to implement and evaluate CBT and OSCE results. CBT implementation and evaluation are conducted according to the following workflow. 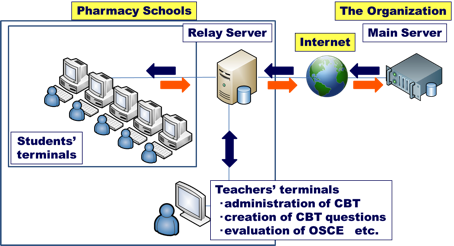 The system of CBT (Computer Based Testing) incorporates functions for providing sets of questions that guarantee the overall difficulty level while issuing different questions to different students, functions for supporting the management of teachers nationwide who are involved in 4-step assessment of questions, and functions for updating questions that reflect revisions in relevant laws such as the Pharmaceutical Affairs Act. Furthermore, upgrading is constantly being made to the test software according to the development of Information and Communication Technology (ICT). The system also supports OSCE implementation. The system selects six exams at random for each school, and also works as an input system for evaluations of each exam. Furthermore, test results of all schools are uploaded to Main server (see below) through the OSCE assisting system. The infrastructure hardware for the system is made up of the main server located in Tokyo University of Science, the backup server in Fukuoka University, and relay servers located in 74 schools. Implementation of CBT: Creation of question sets, assignment of question set for each student, scoring of each student’s answers, etc. Monitoring of status of relay servers, etc. Assistance for evaluation of OSCE results, etc. The main server reliably backs up the important data, and is synchronized with backup server. The servers are securely protected and constantly maintained. We are in a position to meet all conditions for risk management.